In 1746, Rev. Michael Schlatter, originally from Switzerland was sent to America with the authority from the Church of Holland to visit and organize the churches in America. Rev. John Philip Boehm had been making reports to the Dutch Church as early as 1734. On September 29, 1747 four ministers and twenty-eight deputies (elders) organized the “Coetus of the Reformed Church in Pennsylvania.” The Coetus met yearly from 1747 to 1779 except 1779 because of the danger in traveling because of the Revolutionary War. The church was dependent upon the Church of Holland for its pastors, and authority to ordain ministers. In 1752, Schlatter returned to Europe and returned with six new ministers, one of whom was William Otterbein (who helped to establish and ordain with Francis Asbury the first ministers of the United Brethren Church). The Coetus became more independent with time and separated from the Church of Holland in 1793 to form its own Synod. A Seminary was established in Mercersburg, Pennsylvania and later was moved to Lancaster Pennsylvania where it remains to the present. The German Reformed Church eventually became known as the Reformed Church in the United States. In 1819 the Synod decided to divide into Classis. 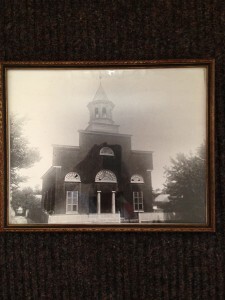 The Maryland Classis which originally included the Virginia churches met for the first time in 1820 in Frederick. Its second meeting was held in Sharpsburg and also returned there in 1833, 1848, 1860, and 1893. On June 26, 1934, the Evangelical and Reformed Church was formed from the merger of the Evangelical Synod of North America (a Lutheran tradition) and the Reformed Church in the United States. The Congregational Christian Church was formed in June 27, 1931 from the merger of the Christian Churches in the United States (some of these were part of the Stone-Campbell tradition) and the Congregational Church (Pilgrims and Puritans). The Evangelical and Reformed Church, and the Congregational Christian Church merged to become the United Church of Christ on June 25, 1957. It is estimated that before 1740 at least 15,000 members of the Reformed Church were in America. These German Reformed Settlers initially settled in eastern Pennsylvania then moved west and south. The Cumberland and Shenandoah Valleys became the sites for many of the early German Reformed Churches. The earliest Reformed Church in Washington County is located at St. Paul’s near Clear Spring on U.S. 40, which is also known as the National Pike, a major trail headed west. It had its beginning in 1747. Hagerstown was founded in 1762 and Jonathan Hager, its founder is buried in Zion Reformed Cemetery. Zion Reformed Church was founded in 1770. The Town of Sharpsburg was laid out on July 9, 1763, at that time, a part of Frederick County. Washington County was created in 1776 from a portion of Frederick County. Christ Reformed, Sharpsburg had its beginnings about 1764 when Rev. John Conrad Bucher, originally from Switzerland baptized here. The congregation may have met in the same building with a Presbyterian Congregation prior to purchasing the same building. This building was constructed about 1768. The “Maryland Gazette of June 8, 1769” reported that “Six Hundred Dollars had been raised by lottery to complete the Reformed Calvinist Church and build a school.” On April 2, 1774, lot number 61 in the Town of Sharpsburg was purchased by Christian Ormdorf, George Keiffer, John Middlekaufff, and Conrad Hayberger, trustees of the Dutch Calvinist Congregation from Abraham Lingenvelter for the sum of One hundred sixty pounds. According to the deed, there was already a church building on the site (according to an earlier history it was called “Old Ironsides” Presbyterian Church and was served by a Mr. Matthews who was stationed in Shepherdstown, Virginia (now West Virginia). A semi-circular addition was later added to that building and became known as the “Jew’s Harp” church. This building was torn down in 1832. In 1830, lot number 46 on West Main Street, our current location, was purchased from the Mary Ground estate. A new building was constructed and occupied by 1832. The brick structure had a stepped parapet façade with a central entrance defined by two white columns. Large windows were in the flanking bays. Above the entrance and windows were large lunettes. A lunette also provided illumination for the balcony that served as seating for slaves and domestics. A massive framed cupola topped the structure. In 1862, during the Battle of Antietam, the church served as a hospital for Union troops. At the time of the battle the church had straight backed pews, and boards were laid on top to make beds for the wounded. Beginning in 1890, the cornerstones attest to three renovations: 1890, 1946, & 1965. In 1890 the front façade was completely remodeled. The two giant white pillars were left standing as part of the wall to help support the church. The original center bay entrance was replaced with the beautiful stained glass hand leaded window donated by the 16th Connecticut Regiment as a memorial to those brave comrades that gave the ultimate sacrifice. Besides the window, they also donated $100 cash to the church. The windows of the east and west elevations were altered from the previous rectangular to pointed arch openings. The interior also had changes made; the straight back pews were replaced with the current circular ones, the old plaster ceiling was removed and replaced with wooden one extant today, and the old gallery was removed. Some of the original floors were left intact. A vestibule was placed on each side of the front of the church with a belfry over the east one. A steam plant replaced the old coal stove and a recessed pulpit platform was added with a small room on each side. There was a rededication in 1891. In 2007 the church began to restore and preserve the historic stained glass windows at a cost of $34,000. Thanks to a $5,000 grant from Preservation Maryland and the Maryland Historic Trust along with other donations the project was completed in 2008. Christ Reformed United Church of Christ continues its rich heritage of witness through the Holy Spirit to Jesus Christ as the Son of the living God. No matter who, no matter what, no matter where you are on life’s journey, you are welcome. Sunday morning worship is at 9:00 AM. The current pastor is the Rev. Delancy Catlett. He can be reached at (301) 582-1728 for further questions or pastoral care.